“Nobody reads a mystery to get to the middle. They read it to get to the end. If it's a letdown, they won't buy anymore. The first page sells that book. 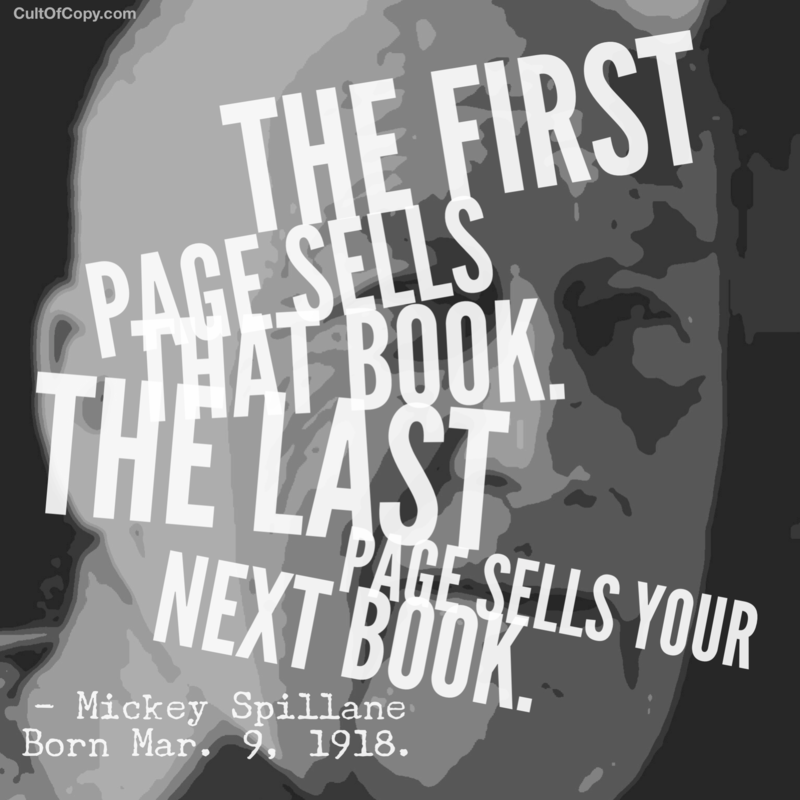 The last page sells your next book.” – Mickey Spillane, Born Mar. 9, 1918. Spillane never wrote “literature” like the kind professors value. Unless they're trashy professors. He mostly wrote pulpy detective novels (featuring Mike Hammer), but though he wasn't a respected “artiste”, he sold a fuckload of books. And even before success at serial novels, he wrote for comic books. And there is a distinct feature of that kind of storytelling that is important here. Both pulp novels and comics are about keeping you in the queue. You're either consuming, or eagerly awaiting your next morsel to arrive. The reader is conditioned to take each “fix” as a temporary respite while they await the next fix. It is promised and teased, and just as promised and teased, it arrives and thrills… But doesn't END. I've often talked about how similar serial fiction and comics are to what we info marketing personality types do. An email list or a blog or a community forum – all are ideally served by the same principles. I want you to read and get value. But I want you to also anticipate the next thing to read. And the next. And Spillane spills the secret here for us. Have a nugget of something awesome that is SELF CONTAINED. But that ALSO baits you with what is coming up next. It's that simple. Set expectations. Make promises about the enjoyment of what's coming. And then deliver on the promises. Etc. And so on forever. Consistency. When you set the audience's expectation, all you need to do it meet it. Don't miss it. Tell them when and where to look for it, and don't leave them hanging. And the audience will grow and grow, and come to follow and rely on your stuff more and more. For an example, consider this post. Tomorrow, I'll have another quote for you, right? Another valuable tidbit or insight that's worth a few minutes of your day. You know that, right? And you know that it will be right here where you found this one.